When I was a child, the carefree months of summer meant long, leisurely days of play with my brothers and my friends—and my siblings were the dearest of my friends. School vacations were also a time for sports camps, cultural excursions and, especially, family adventures. 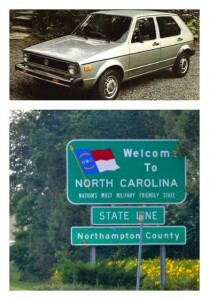 Both my parents were from North Carolina, so my brothers and I packed into the back of our Volkswagen Rabbit for long, road trips down to the South to spend time with relatives. My grandmothers were gardeners and fantastic cooks, so summertime also signified the onset of succulent, seasonal eating with watermelon, strawberry shortcake and peach cobbler. When we visited my mom’s mother, the days took on a timeless quality. I would usually wake up to the overpowering scent of boiling prunes that were part of my grandmother’s daily breakfast. We kids had cheesy eggs or our pick of the popular cereals she stocked up on just for us, not realizing we were never allowed such sweet breakfasts back at home. I believe she asked her neighborhood friends what their grandchildren ate, which is how we also wound up with Frosted Flakes, Oreos and full-fat ice cream on the summer menu. Yet the gastronomic memories I cherish the most from childhood trips to North Carolina featured the fresh produce locally available during the summer season. If I close my eyes, I can still smell and taste the tart freshness of the peaches my grandmother sliced up, sprinkled with sugar and nestled in saucers of cream. Freshly picked plums often sat in a basket on the middle of the kitchen table in the afternoons, inviting a refreshing mid-day snack. Fruits and vegetables were harvested from neighborhood trees and gardens. The woman who lived next door was a master of canning, and we benefited from her bounty. Cucumbers, beets and greens were pickled, while plum, peaches and pears were made into mouth-watering preserves I greedily devoured during our visits and dreamed about the rest of the year. My grandmother’s garden yielded “exotic” vegetables like collard greens, okra and pole beans, as well as the familiar green beans, tomatoes and zucchini. I would eagerly help my grandmother collect the harvest, smelling and feeling the earth between my fingers. Afterward, she would enlist me to help prepare the vegetables for cooking. 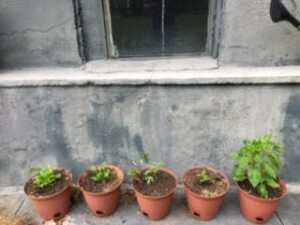 While I grumbled about it at the time, one of my favorite, summer memories was sitting outside on the steps to the right of the house–a paper bag between my legs–breaking off the stem of the aptly-named snap peas and “stringing” the fibrous membrane that ran from the tip to the tail of the pod. Snap peas are often best straight from the vine, so I always popped a few raw ones in my mouth to crunch on while I completed stringing the others. My grandmother briefly steamed them, so they were tender but still crisp when we ate them. Her favorite seasoning for the naturally sweet snap pea (also called sugar snap pea) was salt, and she likely also added butter and black pepper. So simple, yet so delicious. 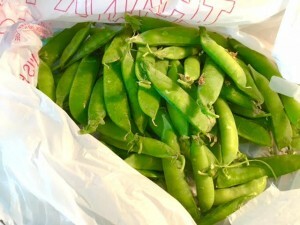 Last week, I spotted snap peas at the farmers’ market by our house in southern Connecticut. A wave of nostalgia enveloped me so fully that I had to buy an overflowing bucket of the vegetable. I was excited to experiment with snap peas, which can be added raw (or nearly raw) to salads or sautéed with other vegetables in coconut or olive oil for a stir-fry. They can also be grilled, roasted, boiled or blanched. 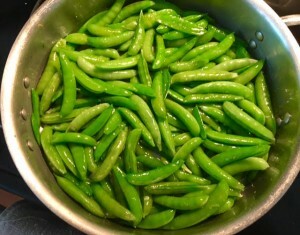 But, a word of caution: The pods of snap peas split open if you cook them too long. While the peas by themselves are delicious, the overcooked pod can be too fibrous to pleasurably chew. In fact, The Awl considers it a crime to expose snap peas to heat for any significant length of time and offers a few tasty recipes of its own for enjoying the crisp vegetable. I liked to sautée them in coconut oil just long enough for them to heat up but remain crispy, and then I toss in pink Himalayan sea salt. I could literally munch on these all day. Snap peas can also be dipped in dressing, hummus or guacamole for a snack. As my husband and I are off grains, a surprisingly lovely way I’m enjoying our snap peas is by dunking them in the homemade pesto sauce I also purchased at the farmers’ market. And I’ve found an additional use for the richly flavored sauce with fresh, seasonal produce—zoodles. While traditional pasta is out of our diet, spiralized vegetables are not. Zoodles is a fun nickname for zucchini noodles, but you can also make noodles out of beets, squash, carrots, cucumber and so much more. 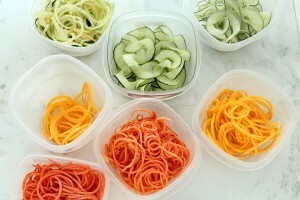 You can use fancy, crank machines, like the Tri-Blade Vegetable Spiral Slicer or a simple Julienne peeler. 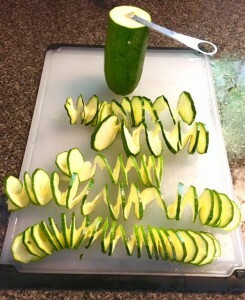 I used the “MagicSpiral,” a stainless steel spiral garnisher on fresh zucchini. I first lopped off the ends of the vegetable. 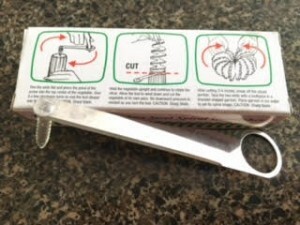 I then firmly pushed the point of the plastic screw of the slicer into the middle of top of the zucchini. 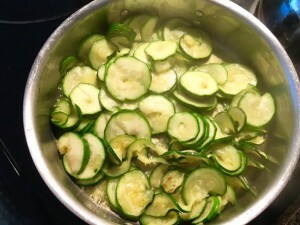 Rotating the slicer took some getting used to, so I recommend that you make sure you post the screw dead center of the vegetable and slowly wind the tool around the upright zucchini, taking tighter turns that will yield thinner pasta. Inspiralized offers an excellent example of how to spiralize vegetables perfectly. You can set the spiral shape of a veggie by placing it in ice water. I choose to lightly sautée my zoodles in a few tablespoons of coconut oil. While I definitely need to work on the presentation, the flavor speaks for itself. 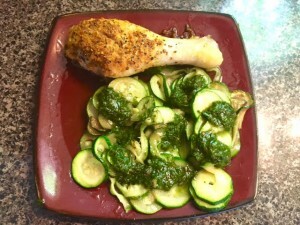 I scooped some warmed-up pesto onto the cooked noodles, and served alongside chicken drumsticks. The drumsticks were seasoned with turmeric, coarse black pepper and Montreal Steak seasoning, before being baked at 400º for approximately 30 minutes. As the long days of summer settle in, I’m looking forward to cooking up more seasonal produce fresh from my container garden. I’ve already been picking the mint leaves growing in a small pot in the kitchen. With an infusion tumbler, I’ve been slicing up lemon, cucumbers and adding mint to refreshingly flavor refrigerated water. 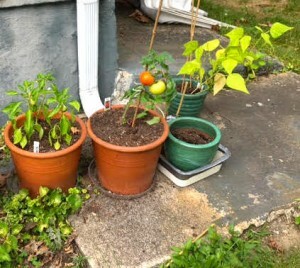 In the backyard, I have two varieties of tomatoes, lettuce, beets, Cubanelle pepper, cucumber and zucchini eagerly growing. I can’t wait to see what my beloved plants will produce (hang on little tomato! ), and my mouth is watering just thinking about the fresh meals we have in store. What wonderful memories you have of your grandmothers garden. I could taste the fresh fruit that you described. I love snap peas. I’ve never done anything other than eat them raw. I eat them too quickly to do anything else with them. Lol! Lori, I’m glad my trip down memory lane called up some pleasant flavors for you too. I love snap peas raw as well, but I sautéed them very briefly with coconut oil and doused them with Himalayan sea salt, and I could literally snack on them all day.